The State Meet is the best of each of the seven regions descending on the same course on the same day. Many of the teams had tough battles at their regional meet to even get to the Horse Park. For traditional powers, the regional meet is a formality to a guaranteed state meet appearance. But what happens with the region alignment when they get to the State Meet? We scored each of the state meet races by region alignment. For example, Ciara O'Shea of Madison Central scored a 1 in the Class AAA girls races for Region 7. While Karlee Hoffman scored a 2 for Region 2 in the same race. 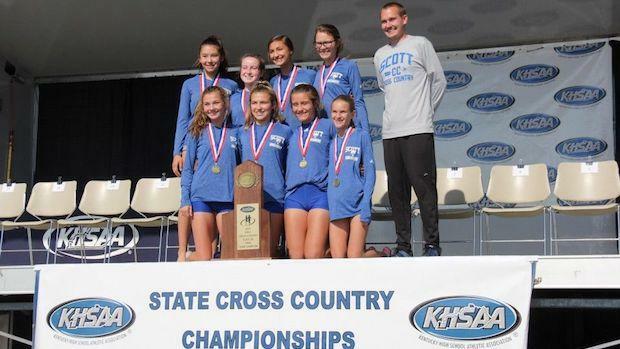 With these scores in place, the team scores were created from the top 5 runners in each region and tiebreakers coming from the 6th runner (which happened in the Class AAA girls team scores). So, check out your race and where your regional super team placed by clicking through the pages to get your particular race. Trinity Head Coach, Scott Holznecht, discusses his team's state championship!